Divided into three sections, Chaissac – Dubuffet: Entre plume et pinceau, illustrates the cross-matching of both artists in a chronological order. It starts in 1946 with their first exchange of letters and ends in 1964 when Gaston Chaissac died. With works, documents and a selection of original letters that punctuate their lives, the exhibition traces the journey of these two iconoclastic artists. 448 letters, tells their passions and their hates, their hopes, their successes and disappointments. 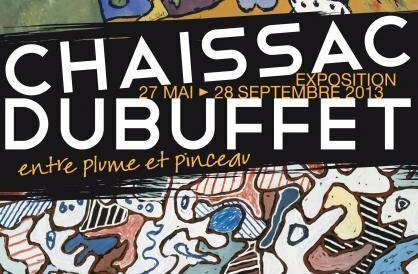 High color gouaches of Gaston Chaissac reveal an outstanding colorist while the textured "hautes pâtes" by Dubuffet excel in crushing the material. This exhibition invites visitors to discover this new art that both practiced praising the recovery and transformation of poor materials.